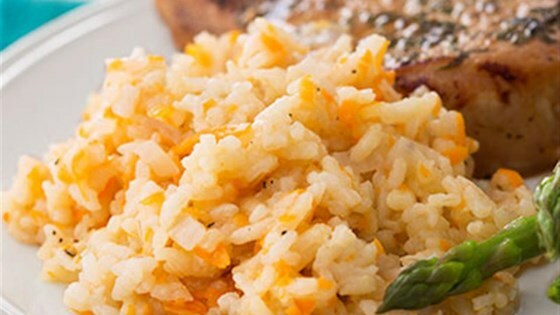 "Risotto is made super-easy with Reynolds® Oven Bags. No more endless stirring at the stove--all you have to do slide the pan into the oven." Preheat oven to 400 degrees F. Add flour to a Reynolds(R) Large Oven Bag. Shake. This helps prevent bag from bursting. Place bag in a 13x9x2-inch baking pan. Add rice, sweet potato, onion, 1 tablespoon butter, thyme, garlic, and pepper to oven bag. Turn bag several times to mix ingredients. Arrange ingredients in even layer in bag. Fold down bag opening two times to hold it open; set aside. Microwave chicken broth and wine in a medium microwave-safe bowl or measuring cup for 3 minutes on high power until liquid is hot (140 degrees F). Carefully pour or ladle liquid over ingredients in bag. Carefully unfold bag opening. Place pan in oven, allowing room for bag to expand during cooking without touching heating elements, wall, or racks. Bag should not hang over pan. Bake 25 to 30 minutes or until most of the liquid is absorbed. Let stand 5 minutes. Cut open top of oven bag carefully. Remember: Always support bag with pan. Spoon rice mixture into a large serving bowl. Stir in remaining 1 tablespoon butter and 1/4 cup cheese. Sprinkle with additional cheese, if desired. Eliminate the pain of cooking risotto by using an oven bag! This no-stir recipe can be baked in the oven while you help with homework, tidy up or take a moment to relax. And with oven bags, there's no sticky pan to soak and scrub when you're done.